Shelby’s Watch, LLC is a locally owned, licensed, bonded and insured, business serving Columbia, MO. We are a service for the absentee homeowner, which provides a periodic visual inspection of your home and property in order to discover and report potential issues that may arise while you are away. We also offer armed security services to commercial business properties and for special events. As homeowners ourselves, we found a need for a professional home watch service in our community after a water line broke and flooded our basement while we were away. Theft, vandalism and damage from natural disasters or mechanical failures, are just a few things that might lead to significant property damage without prompt action. Our goal is to ensure that you have a worry-free experience while you are away. With crime on the rise in Columbia, there is a growing need for security. Commercial businesses often go long hours unmanned, creating an easy target for burglars. Having physical, on-site presence is just one more deterrent. We will be your eyes and ears while you are away. We will be your point of contact with the police if needed. James brings 10+ years of law enforcement experience to our business. He graduated from the MACC Law Enforcement Academy. James is known for being professional, hard working and respectful and will always brighten the day with his outgoing personality and smile. Renee was born and raised in Columbia and knows the area well. She went to Hickman (Go Kewps) and furthered her education at MU, graduating with a degree in Clinical Dietetics. She works as a Registered Dietitian here in town. Renee is known for being hard working, respectful, organized and creative. 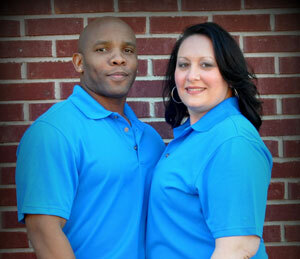 Together, they are a hard working, professional, trustworthy husband and wife team determined to give you peace of mind. © 2014 Shelby's Watch. All Rights Reserved. Powered by Calevir Web Design, Columbia, MO.